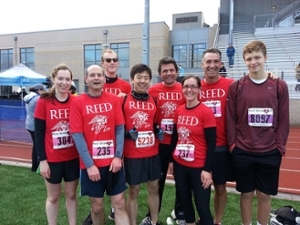 Reed’s scrappy band of self-propelled runners posted impressive results at the Heart Breaker Run in Hillsboro on Sunday, demonstrating once again that Reedies think on their feet. Philosophy major Ki Choi ’17 blasted through the 5K in a scorching 19:40, coming in third in a field of 318. It was Ki’s first competitive run since suffering an injury last semester, and judging by his rapid recovery, he’s only going to get faster. In the 10K, bio major Shannon Bacheller ’16 won her age division, crossing the line at 0:58:29. History major John Young ’15 came in sixth in the half-marathon, blazing across the finish line in 1:26:25. John was first in his age division and is training for the 50-mile American River ultra-marathon in April. Poli sci major Megan Keating ’17 also won her division in the half, coming in at an enviable 1:47:09. For the master runners (that’s running-speak for the over-40 set), bookstore manager Ueli Stadler ran the half in a blistering 1:30:53, demolishing his division, and placing 15th overall. Master planner Todd Pangilinan, public affairs dynamo Stacey Kim, and ink-stained wretch Chris Lydgate ’90 all finished the half in under two hours. The Heart Breaker event follows Reed's record turnout in the Portland Marathon, and signals a renaissance of running on campus. In recent years a chemistry major shattered a longstanding track record and a bio major ran around Mt. Rainier.